Just a short update, now I'm planning the main level. 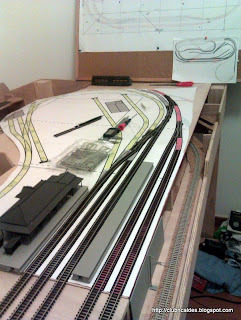 All the hidden tracks are in place and wiring ready (DCC loop, feeder connectors for all tracks and Loconet Bus). I'm still waiting to receive some latching relays with double coil to manage the loop. The layout is basically a dog-bone, and the concrete sleepers track (on the right of the photo, lower level) is one of the ends of this dog-bone that must invert the polarity when any train crosses it. After I have that I'll post a video recording the available run.